The puppies seem to need more and more space now that they are up on their feet. This weekend they began to explore downstairs and will be spending more time down stairs. It is important that they be where the "action is" in the house so they get used to all the sights, sounds, and smells of a normal household. 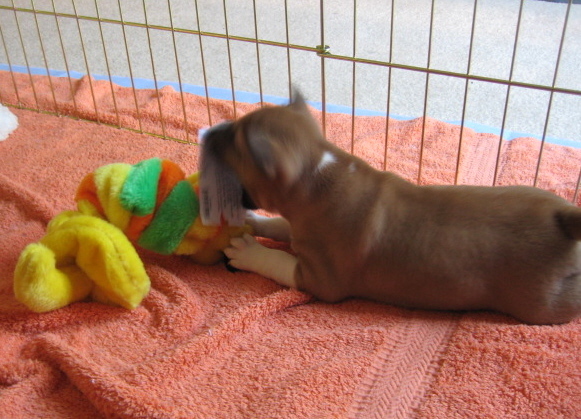 They are playing more and more and starting to eat puppy mush. They have also started to get their teeth so TC is happy to have them exploring other food options. It was still early in the morning but the puppies are beginning to play with each other, and apparently over each other. Bella and Blaze have opened their eyes. Clark's are just starting to open. Dean should be opening his soon. The pups are also starting to get their legs under them. Pretty soon they will be up and moving around on their feet instead of just crawling around. The puppies are 1 week old and growing like weeds. They more than doubled in weight since their birth. I can't figure out how to embed the video yet but if you follow the link you should be able to view some video of the typical puppy activities. We give every puppy in each litter a puppy name so that it is easier when we are talking about them or to them as they grow. Nicky, the sire of the litter, was called Greg as his puppy name as he was the first born boy in a litter of 6, 3 boys and 3 girls. Usually the puppies are renamed by their new owners but some keep their puppy names their whole lives. We have decided on each puppy in this litter's puppy name. Puppy 1 is Dean, Puppy 2 is Clark, Puppy 3 is Blaze, and Puppy 4 is Bella. The fourth puppy, the only girl and the only red and white. She weighed in at 8.5 oz. She is just as pushy as her brothers. This is the third black boy. He also weighed in at 8.8 oz. He was born breach and was probably the most work for TC. Here is the second boy. He weighed in at a hefty 8.8 oz. He is the most plainly marked of the boys. Here is the first black boy, he weighed in at 8.1 oz and even as basically a slug has managed to charm the vet staff. It has been a very long day. Hard labor started at about 7:30am. 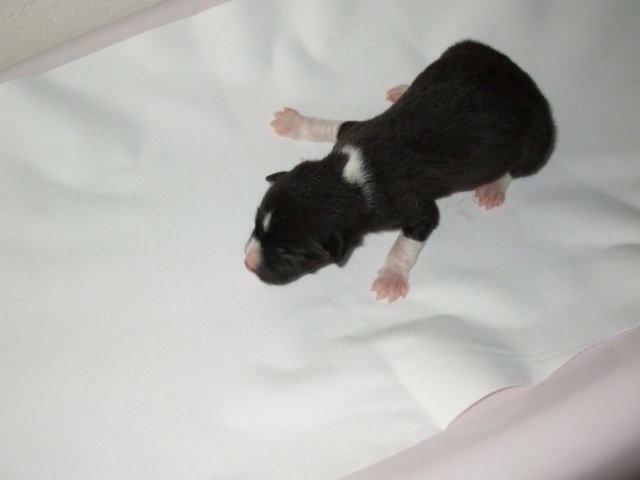 At 8:15am the first puppy was delivered, a black boy. After that she was pretty frantic for about an hour. She couldn't really settle. We would let her have her boy and he would nurse for a while then she would get too frantic and was moving around too much so we would take him away. At 9:25 contractions started again. The continued for an hour with no puppy and she was pushing hard each time they hit so we called the vet. They had us come in for an x-ray. The pups were just not moving toward the birth canal. The vet was worried if she kept pushing so hard for so long she would get too tired to keep delivering so she gave her a shot of oxytocin to help move them along. 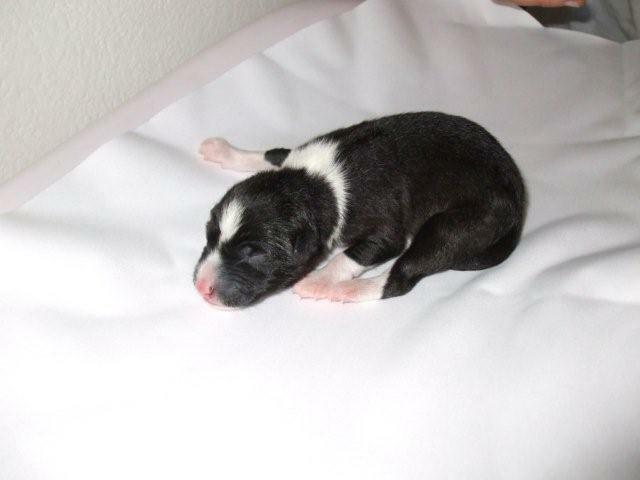 At 11:30am the second puppy was delivered, another black boy. 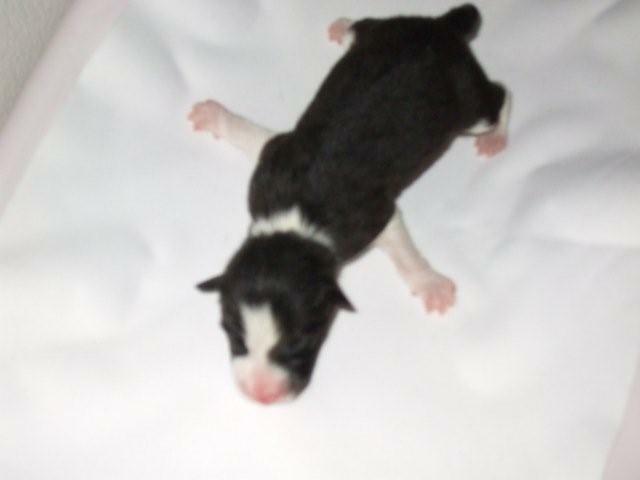 At 11:55 the third puppy was born, another black boy. 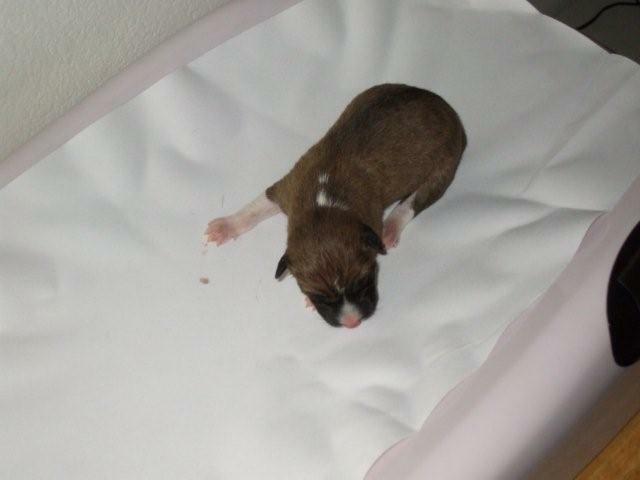 At 12:30 the last puppy was born, a red girl. From the x-ray there was still something in there so another shot of oxy. We found that it was a partially reabsorbed fetus. So she got another shot of oxy before she was sent home. She is comfortably napping while the pups nurse and nap. Pictures soon.